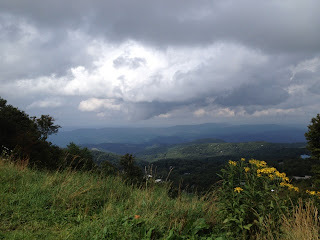 My thoughts are in the Blue Ridge Mountains today, in part because we're getting ready to head up there in a few days. I've also christened my new office by completing my first project in there: this mixed media collage. I started with some gorgeous handmade and marbled papers, some I brought home from Italy in 1995, laying them down as a collage, before painting atop with various acrylic and oil mediums. Whenever you are layering acrylic and oil, the rule is to remember to seal everything with acrylic first and then move on to oil. 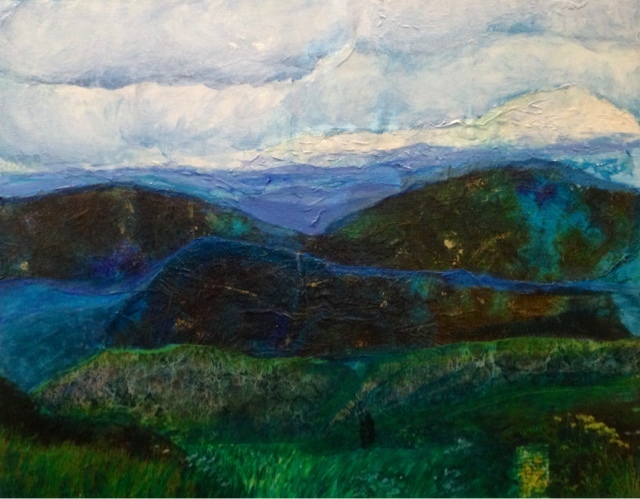 Always use oil on top, or sandwiched between acrylic layers of clear coat, so the oil paint doesn't eat through the underlayers of the collage. In this case I used acrylic Gloss Medium to seal the collage and the acrylic layer. At university I learned to create gorgeous light effects by sealing each layer of oil glaze in between several coats of Krylon Crystal Clear spray paint. That technique allows light to penetrate through the layers of oil glaze and produces amazing depth of color, but it is very smelly and bad for the lungs and since I don't have any ventilation in the office I decided to try the brush on Gloss Medium. I think it turned out pretty well. I used some photos I took on Beech Mountain back in September as a reference. A storm was rolling in that day. Reference photos: a storm rolls in over Beech Mountain. The colors in my piece are a little brighter, as you can see. This is a painting for Jerry. I was originally going to use this in the bedroom, but it seems a bit too agitated. I may just let Jerry take it to work to hang in his office. The piece turned out with a bit of a Van Gogh feel. We all know how he turned out; I hope I'm not heading in that direction! The mysterious thing about art is how, no matter what the artist's intent, some pieces have a way of evolving on their own and taking a direction you might not anticipate. Here is the work in progress while still mostly at the collage level. You can see how junked up my office is already! I hate what a messy worker I am. In typical fashion I had to start painting before I finished unpacking all the boxes. Starting one thing before finishing another...a defining facet of my personality and the cause of so much trouble in my life. In this case, the papers I used in the collage influenced the color scheme. I tried to capture the sense of infinity I have when the layered clouds just blend into the layered mountains and there's no end to one or another and no horizon. I wanted to portray the shadows cast by the clouds when a storm rolls in, contrasted with the lit up, sunny spots. 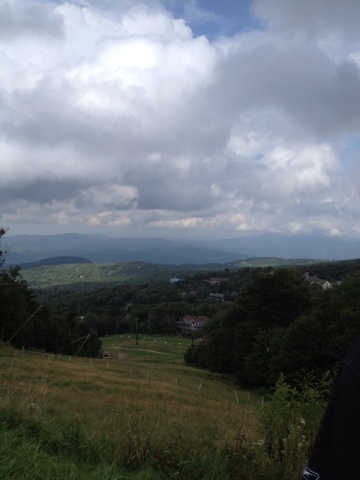 I love to watch cloud shadows race across hills when I'm really high in the mountains. I was also thinking of a certain day, in a different place and time. A few years ago I was on the way home from the optometrist. My pupils had been dilated and when they had gone down enough for me to drive I put on a pair of polarized sunglasses. I was driving down Highway 50 and it was another stormy fall day, with big clouds rolling in but flashes of bright sunlight and leaves like gold coins falling down. The colors I could see with my pupils dilated and the sunglasses on were so much more intense than those my eyes usually process! I remember thinking how amazing it would be to see with such uncovered eyes all the time. The thing is, being able to see so much all the time can be a problem for us. I was taught in art school that Van Gogh was poisoned and made insane by his paint. Vincent Van Gogh had a special formula he mixed himself and no one has ever been able to duplicate certain colors of his, most famously his yellows. I never really understood the big deal with his Tournesois, or Sunflowers, until I was able to see it in person at the National Gallery in London. Those yellow flowers actually seem to glow in that room like the paint is lit from within. It's just amazing and I've never seen anything like it. God only knows what he was using in that paint...it's probably radioactive! But the beauty of those colors is stunning. Art history is littered with artists driven mad by the absorption of foul chemicals from the inks and paints and things they used. Piranesi, inventor of the monotype, became obsessed with hallucinogenic "dream prisons" and Roman architecture. Poor Charles Meryon can actually be tracked in the course of his madness. His first prints are rather staid, tight architectural prints, but by the end of his career the skies swarm with monsters. At first glance a regular Parisian street view becomes on closer scrutiny a nightmare, with clouds turning to flying sharks descending on terrified pedestrians. We were cautioned again and again throughout school to the dangers of our work. I wonder, though, how much of it comes also from living always in extreme awareness. Art requires a life in the mind of so much more stringent awareness than is necessary to ordinary life. If I haven't worked for a while and I start up it often seems to me as though I've been asleep through life, like one of those enchanted princesses in fairy tales. It seems like we subconsciously limit what we process to protect ourselves. Some of us can't seem to do that, though, and then tend to meet a bad end. Rebecca Stead writes so eloquently about this in her novel, When You Reach Me. That is a book for middle school age or so, and even though it covers weighty subjects like the theory of Relativity and time travel, you can probably finish it easily in a day or two. I bought that book for my son, but I highly recommend it for adults. If you've ever had to make a choice when there seemed no choice to make, or nothing you'd actually want, or if you've ever felt you ruined yourself or others through your actions, you'll sympathize with the characters. It's also just a really good story, and one you'll find yourself thinking of again and again. So, anyway, I hope my jagged looking depiction of the mountains is a result of my paper choice and not an indicator of impending madness! More than anything recently, I feel somnolent. The rain here just goes on and on. Every walk I've taken this week has soaked me. The gray days stretch and stretch and make it hard for me to feel awake enough to care about anything. "Tomorrow and tomorrow and tomorrow creeps in this petty pace from day to day, to the last syllable of recorded time..." A trip to the mountains will be the tonic I need, I hope! Today my mother-in-law arrives for a visit, so I have a lot of cleaning and cooking to do, and lots of laundry for our trip. I'm planning a big menu for tomorrow night. I think ham and mashed potatoes and biscuits and maybe cooked carrots. I'm still trying to decide between homemade cream puffs or truffles for dessert. Last year I made heart-shaped cream puffs and they were a big hit. Happy Valentine's Day to you all! 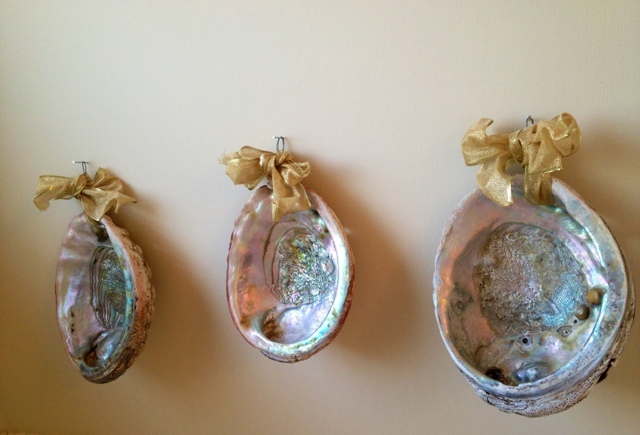 Useful little abalone shell "shelves"
Yesterday my work was quite prosaic: cleaning bathrooms most of the day. I didn't accomplish quite as much as I'd hoped because I kept getting sidetracked by other chores. I searched and searched for the toilet cleaner, last used by my children to clean their bathrooms (later it turned out they emptied it without telling me), and while I was searching I noticed the plants needed watering. Then when I went to water them I saw some dishes to wash. Washing dishes, I stood on a throw rug and noticed it was in need of beating. Then I noticed ALL the rugs needed beating...and so on. It reminded me of a funny poem another blogger wrote called "If You Give A Mom A Muffin" (then she'll want a cup of coffee, and then her three year old will spill it and when she's wiping it up she'll notice something else, etc...). If you've read If You Give A Mouse A Cookie WAY too many times like I have you'll appreciate this parody. Here's the link: http://www.scrapbook.com/poems/doc/29775/60.html. My sister calls this "Cleaning ADD". I guess I have it for sure! Anyway, I've been feeling a little guilty I haven't started any new project in my recently completed office yet. 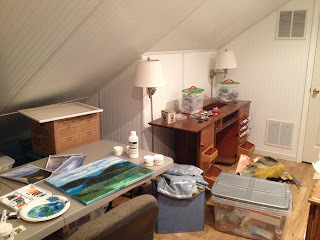 I did also get the dining room turned back into a dining room yesterday and moved my sewing machine and thread upstairs. I started to put all my thread and stuff back into my sewing cabinet. I can't find the drawer to my cabinet, though. It was packed separately and I haven't unearthed that box yet. My sewing machine is still making the alarming screeching noises, so it's obviously going to have to go into the shop. I hope it's repairable. My machine is 14 or 15 years old, and it's been a great machine. I'm nervous. As you might remember, I spent a lot more than I ever have on our bedroom curtain fabric. We figured we could splurge on that since we've never had a nice, decorated bedroom for ourselves and I'm not planning any other curtains for this house. Well, I suppose you can guess what happened! First, our washing machine died and I spent a week washing all the laundry by hand until we could replace it. Then, my 9 year old van gave up the ghost. It had actually been stalling and cutting off and stranding me places for a while. We got it fixed for a bit last year, but that cost $1600 over a three week period and it was starting again. At home it wasn't a big deal because I could call my parents or sisters to pick me up, but here I don't know anyone. So this weekend we went and got a new Dodge Caravan. This one has all the bells and whistles; so many buttons I doubt I'll ever figure them all out! It even has a power inverter so you can run a hair dryer or something in the van. I guess my hair will look nice even when we're camping! Jerry is more into the fancy stuff than I, but it does have a backup camera, which I really wanted. Such a high-tech car has gone to Jerry's head. He was joking the other day that we can call him "LL Cooler J" now instead of Jerry! We have to have a Caravan because I can no longer live without the "flippy floor", or Stow and Go seating. I love it! I can move furniture or giant paintings on day and then drive 6 kids to practice the next. It's like having a truck and a minivan in one. But I never would have spent so much money on the curtains if I'd known we would have all these big purchases coming up. Of course, I guess I should be happy I did go ahead and buy it, because who knows if we'd ever have anything nice if we could see the road ahead! Wouldn't we always be preparing for the bumps? Still, it would be really nice to NOT have to replace my sewing machine right now. Just enjoying what I have and being happy is a huge problem for me. Happiness and good fortune scare me. I'm always waiting for the misfortune that's going to come along to balance things out and break my heart. So I really am glad I was able to enjoy buying that fabric without worrying about the future. Since I haven't had time to do a new project I thought I'd show a quick little decorating idea you can throw together in just an hour or so. 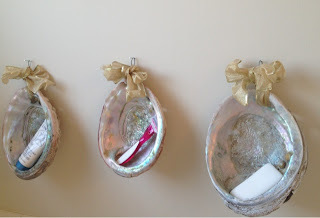 I made these little shell shelves a few years ago. These are abalone shells. My father used to close his optometry practice in California every Thursday evening so we could head to the beach, where he would spend the weekend diving for abalone. We ate abalone so often it was as commonplace as hamburger. I didn't find out until I was in college, abalone is a delicacy many people never taste because it's so expensive. I loved it so much. If you're ever lucky enough to get some abalone to cook, first beat it to tenderize it (my mother used a studded mallet for this), then dredge it in saltine crumbs, then pan fry it in butter. It's absolutely delicious. Because of our high consumption of abalone back in the 1970s, my mom still has piles of shells in the attic. I'm sure you can buy shells for this project. I can remember on the road to the beach we would see all kinds of people who would "decorate" their chain link fences by hanging hubcaps and abalone shells on them. California wasn't quite as sophisticated back then, at least not around Squaw Rock and Highway 1! For this project I chose shells that were similar in size. Abalone shells have little holes along the edge, so I just made a little wire loop hanger through the center hole. Then I covered the hanger with wired ribbon. That's it! They make cute little places for soap and razors and stuff, and they have natural drainage holes. My mom said, "I've had those for 40 years and never did anything with them and you get them for an hour and make shelves!" Of course, they are also pretty just hanging there with their mother-of-pearl interiors, so you could leave them empty. The shells make an unusual storage solution. 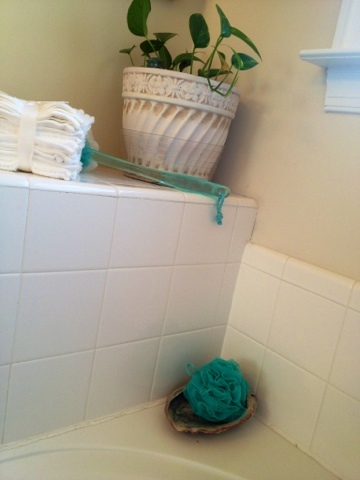 I also used one shell as a little bowl for my bath puff. This is not quite as ideal because the outer shell tends to flake off, so I'm always having to wipe up little pieces of shell, but it's not that big a problem since I clean the tub regularly anyway. I use one shell as a bowl. The abalone shells have the colors I like: lots of seafoam greens and turquoise blues. I try to tie the colors in with the rest of the decor. 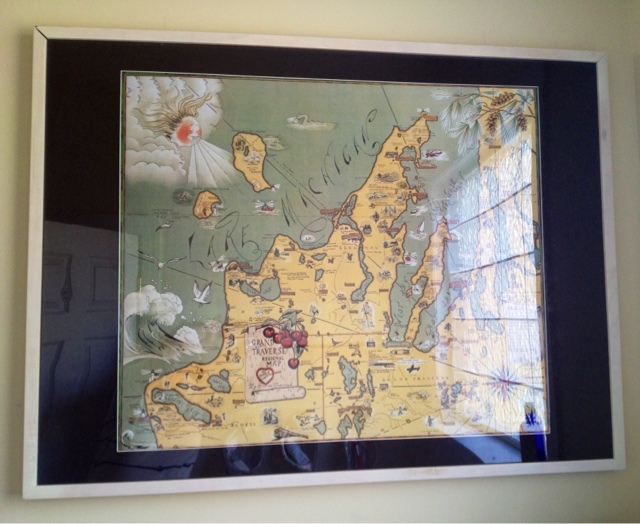 I used my map of Leelanau County, Michigan as a starting point for the decor. This map is a reproduction of a 1930s tourist map and I think it's owned by every member of my family on that side! Northport, Michigan, in Leelanau County, is where my ancestors came from Norway and they built the town to look just like a Norwegian town, with almost every road leading to the deep blue water. I think this part of Michigan is the most beautiful place I've ever seen in the United States. I got in a heated discussion about this not long ago, but I stand by my assertion. My map of Michigan sets the color scheme. I am thinking of painting the bathroom the same Oasis blue by Olympic One. Right one part of the room is oyster shell white, which I don't mind, but the other half is that mustardy camel the bedroom was. The previous owners had an unusual fondness for mustard yellow! Besides that, it's really too close to the beige the homestager made us paint our whole house. I don't ever want to see that color again! I brought in some more blue things courtesy of my sisters. 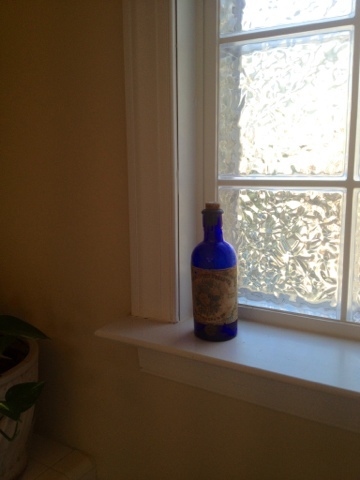 The blue antique bottle is a gift from one sister who bought it in a flea market in Scotland. She knows how I like blue glass! One of my sisters bought this bottle for me in Scotland. 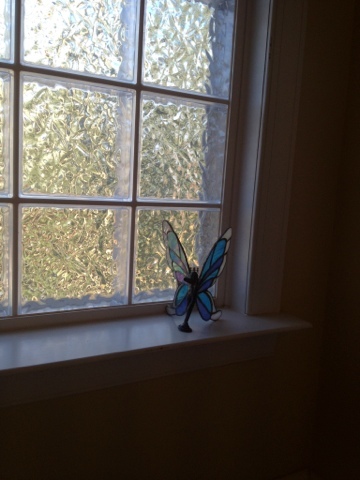 I also brought in this little stained glass fairy. My youngest sister made this with help from my step-father when she was in middle school and I was in college. It's one of her first stained glass projects, and I think she did a good job on it. It's hard to imagine she was about my son's age at the time! It doesn't seem that long ago! My sister made this stained glass fairy. I hope you're able to find some natural inspiration for your decor. 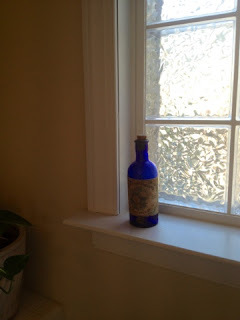 When you start looking around, there are so many free natural things you can find and use in your house with a little creativity. I have to get going. I realized yesterday the movers brought all our brooms and dusters, but not my mop and bucket! That's the problem with having others packing your stuff. I keep finding certain things missing. I've been using my Swiffer Wet Jet on the floors since we arrived but I ran out of pads so I was going to use the regular mop. I have to do the floors because I am feeding the Elders tonight. I asked them to come and give our oldest a Priesthood blessing for his toe. We tried the Lincolnton Ward this past Sunday and we found the congregation very nice. I don't know if we're disciplined enough for it though...it's over 30 minutes away and quite early. We will just have to see. I wanted to add a little update to my earlier Norwegian Women Don't Get Fat post: I'm happy to announce my plan has been working and today I am down 17 pounds since my doctor's appointment for my wasp sting in September. That's probably about 20 pounds since the beginning of summer. It's maybe not as fast as I'd like, but I am steadily losing, so that really helps to stay on course. Some of the weight loss came from angst over an unhappy series of events at the end of the year. I guess it's nice something good came of it all. I am really proud of myself, though, for turning to running to work through my thoughts and troubles and not wine and cheese and cookies! I still have a long way to go, but I know many of you are working on similar personal plans and I want you to know it will eventually work if you keep it up!